Place the Wound tokens nearby. Give the Godfather's desk to the oldest player, who places it in front of his Character. 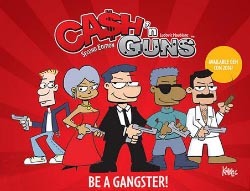 Each player takes on the role of a gangster during the split of a gigantic take. At the end of 8 turns of play, the richest player still alive wins the game. Each turn is divided into 7 steps. The Godfather, who has a game aid printed on the back of his desk, is in charge of going through the steps one after another. At the beginning of each turn, flip 8 Loot cards face-up, and make sure that the New Godfather token is showing its desk available side. Each player secretly chooses a Bullet card (either a Click, or a Bang!) and places it face-down in front of them. Note: Be careful, each card can only be used once! You have 8 cards, one for each turn. The Godfather for the turn counts to three. 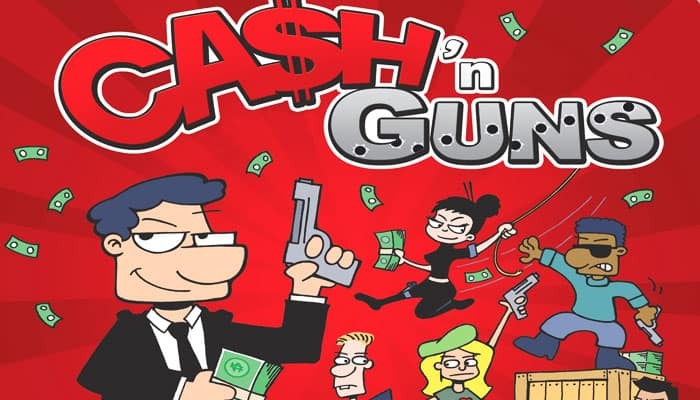 On three, each player must hold at gunpoint another player (by aiming their foam gun). Note: Be careful, a player who is too slow will not hold anyone up that turn. Once each player has chosen a target, the Godfather can order another player to change target. The chosen player must choose a different target. leave their Character standing and shout: "Banzai"
A player who lays down their Character discards their Bullet card facedown (they're not shooting), and will not take part in the sharing of the loot. However, that player is guaranteed not to be wounded. A player who stays standing takes the risk of getting wounded, but has the chance to get shares of the loot. If your target has decided to lie down, you must discard your Bullet card face-down. You don't shoot cowards. Bang! : the targeted player is wounded! They take one Wound and lay their Character down. They will not take part in the sharing of the loot this turn. The effects of the cards are all applied simultaneously; two players pointing at each other can wound each other. It's possible to get more than one wound in a single turn if you're the target of multiple Bullet cards. A player who has a total of 3 or more wounds dies and is taken out of the game. Reminder: If your target has laid down or if you've laid your Character down, your Bullet card will be discarded and will have no effect. 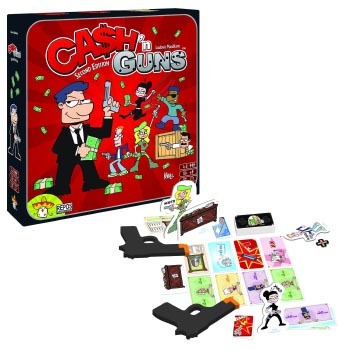 Starting with the Godfather and going clockwise, each player whose Character is still standing (not freshly wounded, not laid down) takes a share of the loot (card or New Godfather token). If the Godfather has laid down or is wounded, it's the closest standing player going clockwise who starts helping themselves to the loot. The split ends when everything has been taken. It's possible to go around the table multiple times. In some cases, it can also happenthat a single player gets everything. Instead of taking a card, it's possible to flip the New Godfather token to get the desk and become the Godfather on the next turn. This doesn't change the current sharing of the loot. We suggest keeping your Loot cards face-down for the rest of the game. The game ends once the 8th turn is over - once all the Loot cards have been distributed. Only the players who are still alive can claim victory. Each player still alive counts the number of diamonds cards they own (regardless of their value). The player who has the most takes the $60 000 bonus card. In case of a tie, no one gets the bonus. 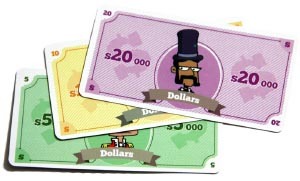 Then, each player adds up the total value of their loot. The richest player wins the game. In case of a tie, the player with the most wounds wins. If a tie still occurs, the players share the victory. Note: At any point in the game, if there's only one player left alive, that player automatically wins the game. The bills are worth $5 000, $10 000, or $20 000. The diamonds are worth $1 000, $5 000, or $10 000, but the player who owns the most diamond cards gets a bonus of $60 000 at the end of the game. In case of a tie, no one gets the bonus. 1 painting is worth $4 000. 2 paintings are worth $12 000. 3 paintings are worth $30 000. 4 paintings are worth $60 000. 5 paintings are worth $100 000. 6 paintings are worth $150 000. 7 paintings are worth $200 000. 8 paintings are worth $300 000. 9 paintings are worth $400 000. 10 paintings are worth $500 000. First aid kit: When a player takes the First aid kit, he immediately heals all of his wounds. Note: If the player has no wounds, the First aid kit is discarded without effect. 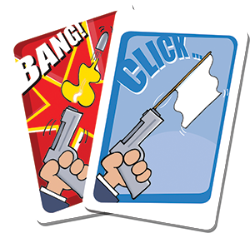 Clips: When the players takes a Clip card, they will also take a Bang! card from the discard pile (face-up or facedown) and immediately adds it to their hand of cards. That player must discard another card. Note: If there are no Bang! cards in the discard pile, the Clip is lost.